I am known for making a lot of hearts in my work, this is the reason some people call me "The Queen of Hearts". :o) Sometimes I think I will stop making them, I do not want to bore anyone with them but I just can not stop. Every heart I create has its own life and personality, each heart looks different than the others I have made. 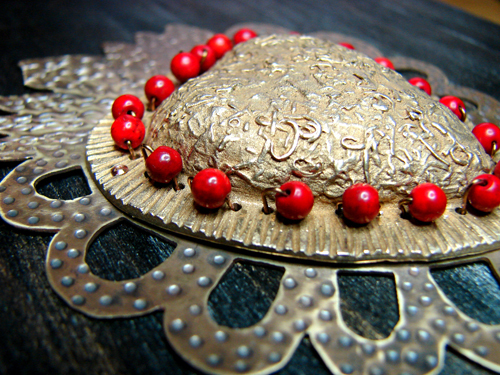 I have been waiting for the right moment to transform a bronze clay heart I made a while ago. Today was the day I felt it was the right time for me to do it. 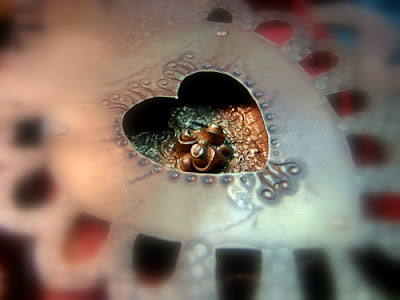 Here it is my journey on this new heart which I love as much I love all the others I have made. I made a lot of drawings and to be honest, I did not go with the first one I made for this piece. I just did not feel it was a good match for my bronze clay heart. I decided to go with a different framing and instead of using copper I chose yellow brass this time. After I finished sawing the frame in my brass sheet, I filed the piece and prepared it for my chasing tools. 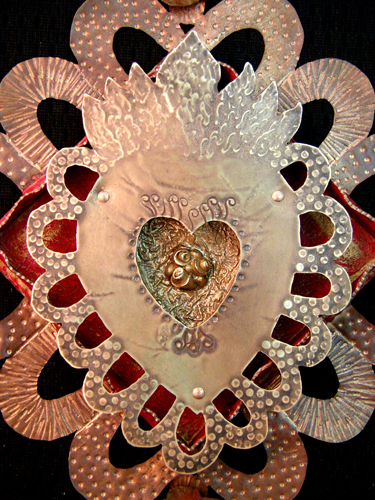 This is one of the steps I enjoyed the most because I see how a simple metal cut-out can be transform into something so different and soulful. After I finished with the stamping I applied heat patina to the brass to bring out the copper in it. I sanded some of the patina out just to leave enough coloration to give the piece a warmer look. 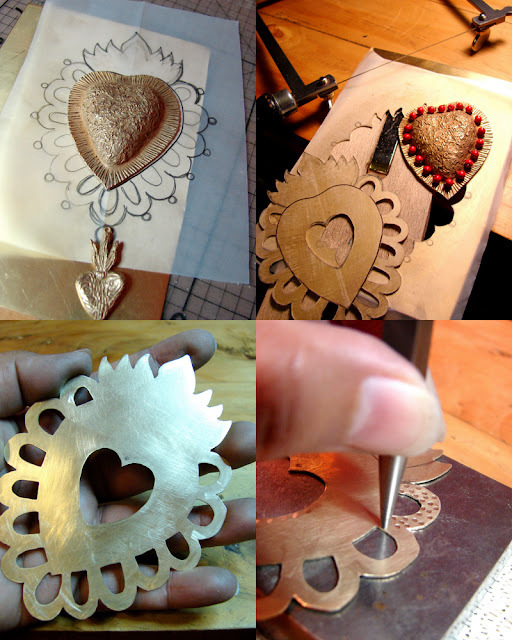 The bronze clay heart was attached with rivets to the frame and now I am trying to choose if I want to rivet a bail or fabricate a chain to the piece. Bronze clay, brass, copper rivets and coral. I love how textured it is and the "surprise" of the back. It's really interesting how the texture on the front of the backplate looks on the reverse. When and where are you teaching? I want to do some bronze clay. Lorena your work is truley facinating. 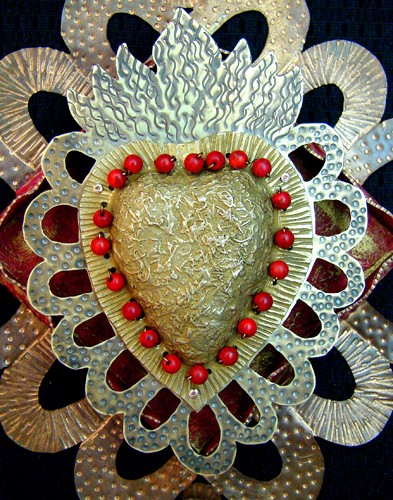 The detail and beauty of this heart is, in your words, a "soulful heart", indeed. I hope to one day take a class from you. Quidate y felicidades. Dear Lorena, UAU!!! I'm amazed, speachless and so on! What a beautiful heart! I Love it! As I am 1,80m tall, i am very found of big pieces! Thank you for showing us these photos! Many kisses! ...And I have to say these: I love de back of the heart also!